Less than three weeks after the tsunami hit, I was able to visit Tamil Nadu (TN), the Indian state that, in addition to the Andaman and Nicobar Islands, suffered the most damage. Most of the people who died in TN were south of Chennai (formerly Madras) in Nagapattinam. I was unable to visit the latter over the past weekend, but I did get the chance to see Madras, Pondicherry, and some of the coastal towns in between. And, while those towns didn’t suffer casualties as heavy as Nagapattinam, the effects of the tsunami were somewhat noticeable. More conspicuous (but not surprising given the hardships of the travel industry in DC and NY after 9/11) was the seeming lack of tourists. 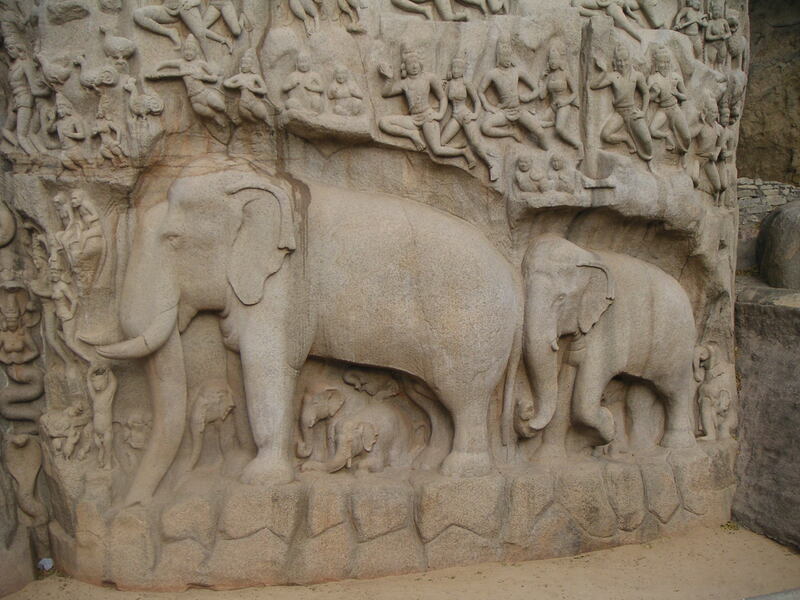 On our way to Pondicherry, we stopped at Mamallapuram (formerly Mahabalipuram – you wonder why they bothered to change the name), a UNESCO World Heritage site known for its ancient Pallava carvings and architecture. 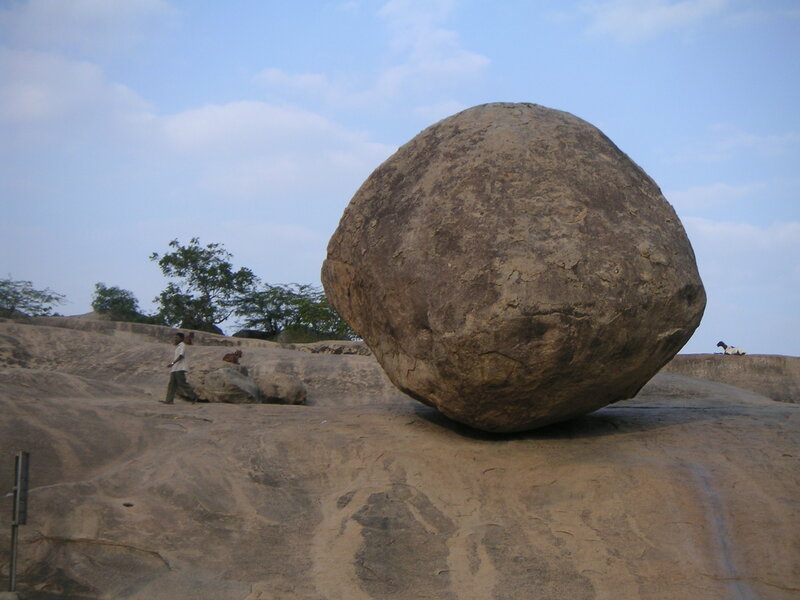 The first group of monuments included Krishna’s Butter Ball, an enormous boulder not unlike the one in the Indiana Jones movie and various other sandstone carvings of scenes from the Mahabharata in very good condition. We were guided by a very knowledgeable man of about 80, who was clad in a lunghi and a button down shirt that was buttoned-down enough to reveal bright, white chest hair on the darkest of South Indian skin. As we were about the only tourists in town, postcard hawkers and vendors of soapstone Ganeshas and painted silks followed us everywhere to remind us that since the tsunami, they haven’t been able to make much of a living. We bought about 10 postcards. Next, the old man drove with us to the Shore Temple. 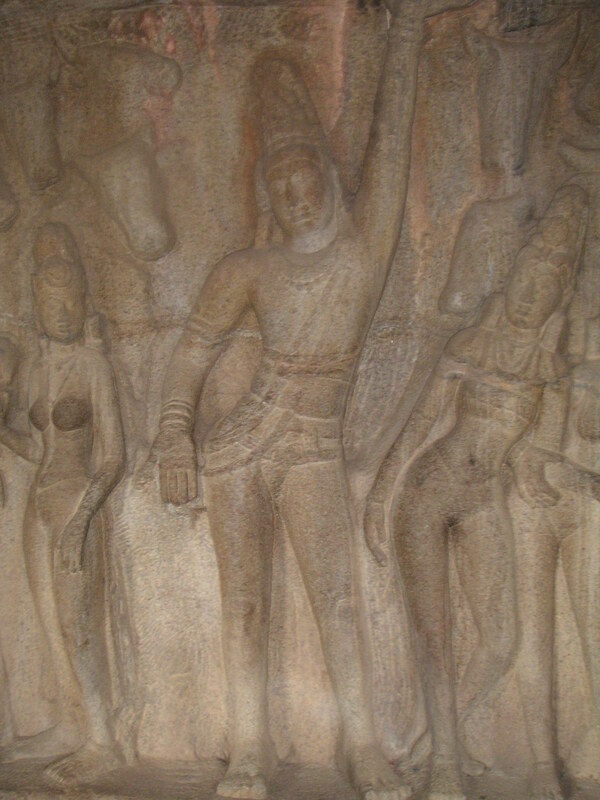 Mamallapuram is perhaps most famous for the ancient Shore Temple, which, amazingly, did not suffer any visible structural damage from the tsunami. The ticket window was closed at that time, so we were not able to tour the grounds. But we were allowed to walk down the “service entrance” to the sea to get a look at the temple from there. About half of the storefronts along the sandy, smoke-filled (the result of burning trash) path were shuttered. The guide told us that the water had reached all the way up to the gate of the temple grounds (quite a long distance), then we noticed that some of the vegetation just over the fence was dying, probably due to too much salt water. 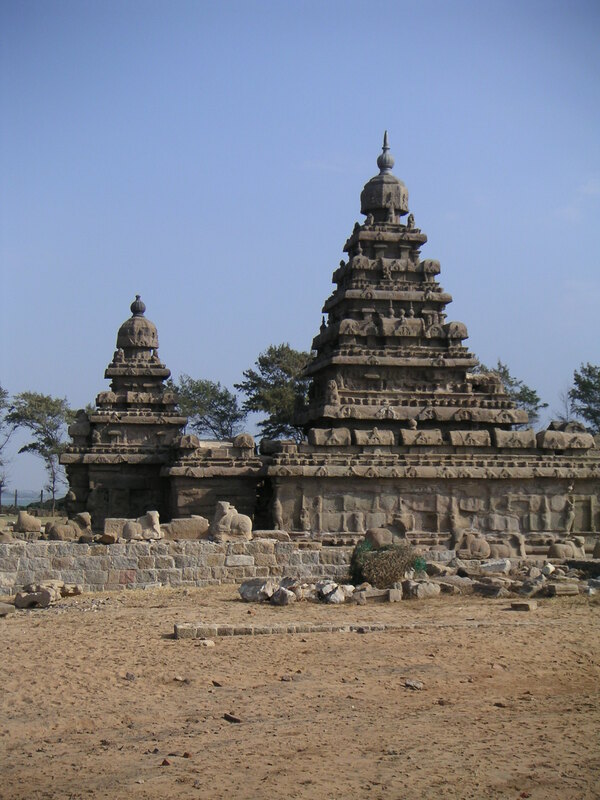 We departed Mamallapuram after about an hour or two, and headed towards Pondicherry. Again, the damage wasn’t instantly visible. If you looked closely around the uninhabited coastline, you could see the line that the water made at such high tide. It was almost like it had seered the earth. But maybe it was only titanium. Many people who died in the tsunami were fisherfolk who lived in shoddy encampments right on the water. The sea came in and erased entire lives and left hardly a trace. The ones who survived moved their tents inland a bit, but they were still living on the shore side of the road. i was in that are this summer during monsoon season here. i kept wondering how it all looked now. i had heard that a lot of the damage in mammalapurum was on the beachfront cafes. did you notice anything? sad that there aren’t many tourists there.. but i think this time of year is slow for them usually as all the tourists are in goa and kerala!